What the climax of Puccini's opera tells us about historical European attitudes to America. 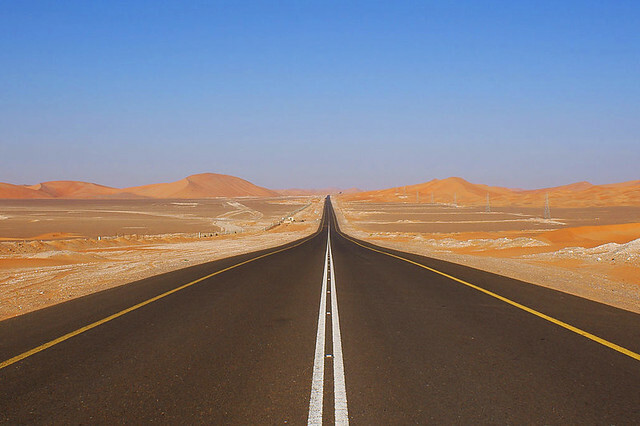 Desert road by Nepenthes, Creative Commons. Louisiana, early 18th century. A few kilometres outside New Orleans: Manon and her lover, Des Grieux, have escaped the city on foot, hoping to reach an English settlement. What lies ahead of them seems insurmountable: plains so vast and mountains so high they would daunt the roughest and hardiest of men and women. As night falls, Manon can walk no further and succumbs to the unavoidable. She collapses from thirst and weariness, and dies in 'the depths of the desert’. The inhospitable land the two lovers describe in the last act of Puccini’s Manon Lescaut has more than puzzled contemporary audiences and directors alike. The original poster of the opera’s 1893 premiere showed sun-baked arid hills and what appears to be like an agave plant (more commonly found 2,000km away in the accurately arid desert of Arizona, not in Louisiana). To put it mildly, the setting is a largely inaccurate description of the outskirts of New Orleans, even some three centuries ago. Devastating hurricanes aside, the southern city is used to a healthy amount of rainfall. And water also abounds in lakes, streams and other watercourses that dissect this meandering delta region of the Mississippi River. It's an area alive with mammals, birds and reptiles. In fact, rather than thirst, it's likely that hungry coyotes or alligators would have led to Puccini heroine's untimely demise. So why did the composer and his librettists get it so apparently wrong? The original source of the opera and later adaptations offer a few possible clues. One of the last scenes of the 1830 ballet-pantomime Manon, by dramatist Eugène Scribe, is also set in the ‘vast desert of New Orleans.’ But his 1856 opera Manon Lescaut, with music by Daniel François Esprit Auber, takes place in the ‘plains, and forests of North America.’ Both Prévost and Scribe seemed to have portrayed a settlers’ misconception about much of America west of the Appalachian Mountains. When US President Thomas Jefferson bought Louisiana from the French in 1803, he regarded this huge territory – which extended all the way to present-day Canada and encompassed all or part of 15 modern US states – as ‘wasteland’. As John Herschel Barnhill writes in The Louisiana Purchase: A Historical and Geographical Encyclopedia, the belief in the area’s desolation was so commonplace among ‘nineteenth-century Americans coming out of the Eastern woodlands and the fertile prairies’ that they named it the ‘Great American Desert’. The term was also used to describe uninhabited lands (by European settlers, that is, as Native Americans had long before populated Jefferson’s ‘wasteland’). And, the historian continues, it further served to create ‘a natural limit to the expansionist urge of Americans’, thus preventing their exodus from an already sparsely-populated US. These 19th-century accounts seem to defend, at least in part, Prévost’s apparent belief in the existence of a desert in Louisiana. But they were certainly outdated when Puccini began to ponder writing the opera. By the late 1880s, more than 200,000 people lived in New Orleans and the city was a bustling American port. Since Manon Lescaut had its premiere in 1893, theatre directors have traditionally retained Puccini’s desert setting. They have adhered to the libretto and Prévost’s well-established convention. But they also seem to concur that the geographical inaccuracy conveniently and brilliantly serves to heighten the dramatic power of Manon’s tragic end. Manon Lescaut runs from 22 November–12 December 2016. Tickets are still available. This is a co-production with Shanghai Grand Theatre. Interesting article, I genuinely believed there was a desert when reading the book. At least it's for the interest of the drama that it has remained a desert since then! "Puccini's desert"?! Nonsense. "landa deserta" simply means "deserted [as in 'unpopulated'] expanse". Una landa sterminata sui confini del territorio della Nuova Orléans. Terreno brullo ed ondulato; orizzonte vastissimo; cielo annuvolato. - Cade la sera.